NSFA, Panacan, Davao City - A massive number of Communist NPA Terrorist Group (CNTG) members continuously turning themselves to the government over the week, signifying their intention to once again abide by the fold of the law. On the evening of March 22, 2019, 27 NPA regular members together with 13 Militia ng Bayan yielded to the Community Support Team of 36th Infantry Battalion (IB) and Barangay Officials of Mampi, Lanuza, Surigao Del Sur (SDS). 24 Supporter/Couriers who are currently residing at Sitio Ibuan of the same barangay also dissociated and denounced their membership and support with the CNTG. The 27 CNTG Regulars is composed of two Team Leaders and 25 members. Twenty three are from Guerilla Front (GF) 30 while three came from GF 21 and one from GF 16. Accordingly, they went inactive prior to their surrender after losing trust with the CNTG and realizing the futility and contradiction of the NPA's propaganda. In a separate instance on March 20, 2019, two CNTG Leaders (one Vice Commander and one Squad Leader) and a medic yielded to Ltc. Roy Anthony O. Derillo, Commander of 58IB at its Headquarters in Barangay Migbantay, Claveria, Misamis Oriental. 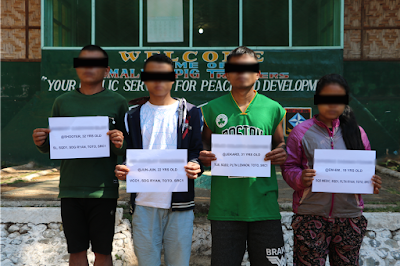 The surrenderees who are only identified through their aliases (@Jun Jun, @Shooter, and @Em-em) are part of the CNTG that is being monitored in Misamis Oriental yielded after their former comrades together with the community members reached out and encouraged them to surrender. They are now undergoing debriefing before they will be subjected to the E- CLIP processing. Meanwhile, Lt. Gen Felimon T. Santos Jr., Commander of Eastern Mindanao Command welcomed this milestone of peace and security and encouraged other stakeholders to join in ending the communist insurgency peacefully. "Let us all be ambassadors of peace by letting those who were lost understand the effort of the government to bring change in the lives of every Filipino, particularly those in Conflict-Affected Areas," Lt. Gen. Santos Jr. said.